October payroll numbers are incredible, the plan is to get everyone on board that the economy is doing well. The MSM is trying to counter the economy but they know they can’t go to far or they will be exposed. This is all part of the plan. If you actually look at the payroll numbers they don’t look that different they are stagnant. Factory order are down. Consumers will start to see inflation, they have for many years but it has been hidden. A new poll says that manufacturing is leaving China but still not coming back to the US, this is step 1, next is step 2 to give the manufacturing companies incentives to return to the US. The gold around the world is flowing out of western countries and into China and Russia. The US is thinking about sanctioning the SWIFT system if they do not do what the US wants, cut off the payment system to Iran. The SWIFT is the central bank payment system, so the US is looking to sanction the central banks. Troops arrive at the border, Trump warns the illegals not to enter the US. The Khashogi case was manufactured by the Turkish government to push an agenda. Russia, China and Iran are creating an alternate route where they will bypass the Suez Canal. Q has returned, Q explains why the days of darkness was necessary and now Q is posting again to show that the Hatch Act was not violated and that the full fury of the storm is here. the BLS reported that indeed consensus was way off when it announced that in October payrolls soared by 250K, just shy of the highest Wall Street estimate, and more than double last month’s downward revised 118K (down from 134K). At the same time, August was revised up from +270,000 to +286,000, offseting the upward revision in August. After revisions, job gains have averaged 218,000 over the past 3 months. But the most important part of today’s report is that the increase in average hourly earnings jumped by 3.1%, this was the highest print since April 2009. New orders ex-defense were unchanged for September after rising 1.5% in August as defense new orders plunged 14.5% MoM. It seems war was a huge player in factor orders. While unsuspecting U.S. consumers continue to expect low, sub-2% inflation according to the latest YTD low breakeven rate, little do they know they are about to be blindsided by a coming inflationary shock, U.S. consumer staple and industry-leading companies are either already in the process of raising prices, or have set concrete plans to do so in the very near future. Clorox for example, which is raising prices on everyday products like cat litter. Coca-Cola also reported higher prices for the past quarter. Food companies are also hiking prices. According to the poll by the American Chamber of Commerce in South China, which surveyed over 200 companies, U.S. firms operating in China warned – they are experiencing extreme difficulties from trade disputes than firms from other countries. 64% of the companies said they were planning to relocate supply chains outside of China, but only 1% said they would consider establishing manufacturing bases in North America. Since 2008 just China and India have accumulated 26,000 tonnes of gold. That is a remarkable figure and virtually the total mine production for that period. There are many other Eastern countries which also continue to buy major quantities of gold such as Russia, Turkey, Iran and Thailand. The US for example haven’t had a physical full audit since Eisenhower’s time in the 1950s. Therefore it is impossible to ascertain what the true holding is. But it would be surprising if the US actually has half of the 8,100 in an unencumbered physical form. If they haven’t sold it covertly, they have most likely leased a major percentage to the market through the bullion banks. That gold no longer stays in London and New York but is bought by China and India and shipped to these countries via Switzerland. The bullion banks then issue an IOU to the central banks which is only backed by paper since the physical will never return from Asia. 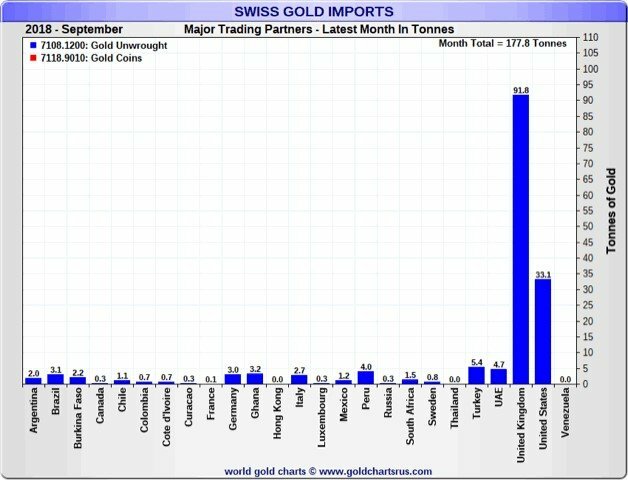 Last month Switzerland imported 92 tonnes of gold from the UK. We know of course that the UK is not a gold producing country. So these are 400 oz bars from UK bullion banks that are bought by Swiss refiners to break down into 1 kg bars and ship to China and India. The majority of the 33 tonnes that came from the US in September is also 400 oz bars from US bullion banks. Most of this UK and US gold is likely to come from central banks. US Treasury Secretary Steven Mnuchin has warned global financial messaging service SWIFT on Friday that it could be penalized if it doesn’t cut off financial services to entities and individuals doing business with Iran.The warning comes as the Trump administration announced the re-imposition of all US sanctions on Iran that had been lifted under the 2015 nuclear deal. The latest sanctions take effect November 4 and cover Iran’s shipping, financial and energy sectors.“SWIFT is no different than any other entity,” Mnuchin told reporters, adding “We have advised SWIFT that it must disconnect any Iranian financial institutions that we designate as soon as technologically feasible to avoid sanctions exposure.”The Trump administration is pressuring its allies to cut Iranian oil imports to “zero” next month. By cutting the country off from SWIFT, Iran would lose its ability to be paid for its exports and to pay for imports.The Society for Worldwide Interbank Financial Telecommunication (SWIFT) is a financial network that provides high-value cross-border transfers for members across the world. It is based in Belgium, but its board includes executives from US banks with US federal law allowing the administration to act against banks and regulators across the globe. It supports most interbank messages, connecting over 11,000 financial institutions in more than 200 countries and territories. The US troops are doing initial assessments of the border crossing at McAllen, Texas according to Fox News, while a Defense Department official told the network that there are around 2,600 troops at staging bases “largely in Texas,” while several thousand more are anticipated to arrive this weekend to California and Arizona. The administration has decided to process asylum-seekers only by “lawfully present themselves” at ports of entry and any claims of asylum made when caught illegally entering the country would be summarily denied under Trumps proposal. This decision by President Trump would inevitably face federal court challenges due to language in the Immigration and Nationality Act which says anyone who arrives in the United States may claim asylum if they have a well-founded fear of persecution. President Trump issued a warning to the migrant caravan making its way to the United States through Mexico, saying if the U.S. military is attacked with rocks, they will be considered firearms. The Turkish government successfully used an information operation to elevate the case of Jamal Khashoggi’s disappearance into a major international incident with strategic implications. The disappearance of Khashoggi is contemporaneous with the disappearance, and possible murder, of the head of INTERPOL, Meng Hongwei. In one of these cases a highly visible individual with international position vanished without a trace and little fanfare; in the other a stunning amount of media coverage resulted in one of the largest news stories of the year. The US Secretary of State was personally dispatched to investigate, as was later the Director of Central Intelligence. The difference in these cases is caused by the existence of the Turkish information operation (IO), and the absence of any similar operation attempting to push for Chinese accountability. The Turkish government attained success through an adaptation of a Russian technique that the RAND Corporation calls the “Firehoses of Falsehood Propaganda Model.”1 In fact the “Falsehood” aspect of this model is dispensable; the model works much better if the information can be proven true, and still quite well if the information is merely not demonstrably false. What is essential to the model used by the Turks and the Russians is the repeated injection of wild stories, not all at once but in controlled sequence. This creates a building effect similar to the increase of tension in a novel or screenplay. A major difference in the Russian model and the Turkish model is that the Russians tend to push their firehose narratives through propaganda outlets of their own creation. Although Turkish-language media supported and helped to drive the narratives, as did Arabic-language media controlled by Turkish ally Qatar, the main outlets that Turkish intelligence used to execute their operation were major Western English- language journalist outlets. MSM, treated the successive firehoses as if they corroborated one another. Russia and India announced earlier this week that they had sealed a long-discussed $6 billion arms deal despite threats of economic sanctions from Washington. And in the latest indication of the increasingly close relationship between the two countries, Iran, Russia and Iran announced on Thursday that they would meet next month to work out the details of a massive project to open up a new sea-land transport corridor that would that would be a cheaper and shorter alternative to shipping oil and other goods through the Suez Canal. the North-South Transport Corridor (INSTC), the name for the new transit route, will connect India to Russia and Europe via a combination of sea routes and an overland passage through Iran, . The annual capacity of the transport artery is expected to reach 30 million tons. 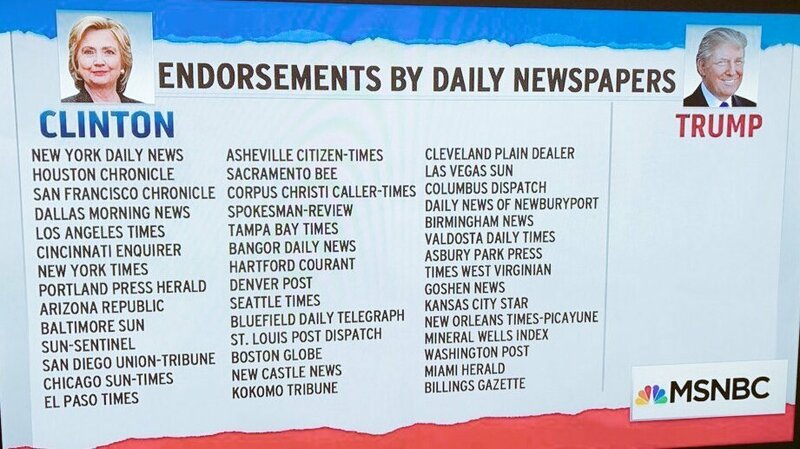 Polls are created and maintaned by the MSM these are psychological weapon designed to make you think and to make you question who you are voting for. IF you here everyone is voting for one candidate and that candidate is millions of votes ahead why bother to vote or maybe I should follow what everyone else is doing. The Hatch Act, 5 U.S.C. §§ 7321-7326 (PDF) (HTML), limits certain political activities of most executive branch employees. For example, the law prohibits employees from engaging in political activity while on duty or in the Federal workplace. It also prohibits them from soliciting or receiving political contributions. The U.S. Office of Special Counsel (OSC) is the agency responsible for enforcing the Hatch Act. General information about the Hatch Act may be found on the OSC website. Now we talked about the hatch act and this is the reason why Q went dark, Q wants us to review the hatch act and Q is telling us that certain things are allowed to be said during this period of time, this is why Q has come back. telling people to stay together to vote, re-read the posts, do not let the deep state divide us, to stay strong. I sure Q and team reviewed the hatch act backwards and forwards to make sure that everything Q is saying complies with the hatch act. What is Q trying to say about the declas, the same thing, Q is showing why the declas could not have happened before the election because it would have been in violation of the hatch act. This is a confirmation and a time table of when it will be released to the public. 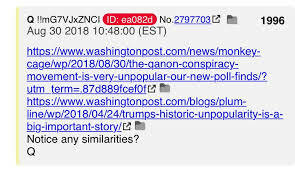 Why did the FAKE NEWS media attempt to cast blame of recent events on the ‘Q’ movement? Attempts to label all those who challenge their narrative as ‘racists’ ‘white supremacists’ will fail [predictable]. There is a reason why we encourage ‘Memes’ so much. Why did select senior members of the D party  send a letter to Don McGahn in early Oct. outlining ‘Hatch Act’ violations re: Q?